Here's the good news for the Jio Prime Users. The users who're still thinking about to activate Jio's Prime Service or not then this news will blow up their mind. Jio introduced their latest offer with their current 2 internet packs(Rs. 303 & Rs. 499). In this offer, the Prime user will get 5 GB of Data on the recharge of Rs. 303 and 10 GB of data with the recharge of Rs. 499 which is worth Rs. 202 absolutely free. This offer will applicable only for those who activate Jio Prime and done the recharge of either Rs 303 of Rs 499 before 31st March. It means this is limited time offer. The 5GB and 10GB pack will be activated when the daily 1GB data limit exhaust afterward you can use this data packs. In another hand, Vodafone and Idea also announced their plans to compete with Reliance Jio. For the Idea Users, they will get 14GB of data for 28 days only at Rs. 345 and Vodafone users will get 28GB of Data for 28 days only at Rs. 346. On both users will also get unlimited calls free for a month. 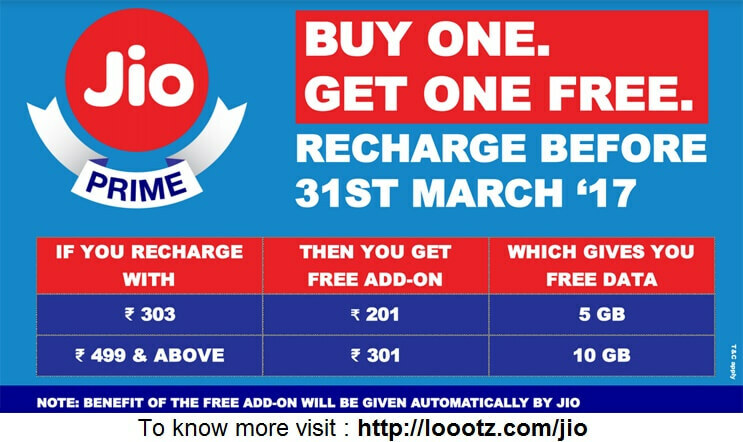 To compete with the other telecom companies, Jio announced this amazing offer. If you want to check this data benefit you can open MyJio App to see the plans and the usage of the data. You can also activate those data by MyJio app, Jio.com Website, or Reliance Digital Stores. We will suggest you try out all those data packs one by one. You can compare it by its bandwidth, price, usability, network, and many things. Many users also got amazing offers at very cheap rates from TATA DoCoMo, Vodafone, and Airtel just because of the Jio Effect.